A character is someone whose activities, thoughts and feelings are revealed in a story. It does not always have to be a person. Often, in books for young readers, the characters are animals. The reader learns about the characters through details in the story. Common Core Standards require the student to focus more on the text when reading. Therefore it is important that teachers help students become familiar with the elements of a story such as setting, characters and sequence of events. This develops the student’s critical reading skills. feelings or thoughts in the show or story. For example, Dora is one character in the show Dora the Explorer. Boots is another character in the show. Can you think of any characters in shows that you watch?" After some sharing say, “Can you think of a favorite character in a book that you have read?" Mention some familiar stories or fairy tales to get the students thinking. Then say, “Today we are going to read a special book called Corduroy. I want you to listen to the details about Corduroy the bear and Lisa. They are the two main characters in the book. I will be asking you to think of words that describe Lisa and Corduroy after we are finished reading. 1. The students will choose either Corduroy or Lisa and write two sentences describing the character and activities of the character. Include an illustration. 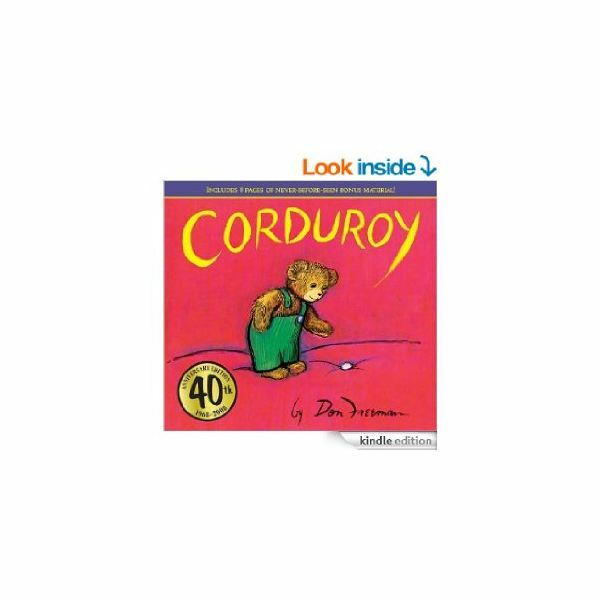 As an example the child might write, “Corduroy was brave when he got down from the shelf and went up the elevator." 2. (Optional) Prepare four index cards by writing the name of one character from the book on each card. Place them face down on the floor or table. Instruct one student to choose a card and say one thing about the character they have chosen. Continue until each card is chosen, then mix the cards up and repeat. Play as long as time permits. Review the concept of a “character" with your students. Then say, “Sometimes a character changes in a story. Today we will read about a little bunny. I want you to be able to describe what the bunny was like at the beginning of the story and what he was like at the end. Also be able to describe what adventure or activity caused the change." Students will see that Buddy never listened to his parents. After a scary experience he realized that listening is important. Hand out the printable worksheet to the students and ask them to fill it out. Lilly’s Purple Plastic Purse by Kevin Henkes: This is a great book for discussing the changes that a character can make in the story. Lilly starts out as a positive-thinking, polite and helpful character. Next she turns into an exuberant and impatient character. Then she is angry. From there she is sorry, brave and finally happy again. The children will enjoy discussing the dynamics of Lilly. Compare Lilly with her teacher, the other character in the book. Common Core Standards require that non-fiction books be a mainstay of the first grade reading program. So it is important to include non-fiction books with interesting characters. Include books that you are using in Science, Social Studies or for a particular classroom theme and do cross-curricular activities. Suggestions might include a book about Albert Einstein, Wilma Rudolph or Johnny Appleseed. Children can dress up as a character from a book! The student must provide the actually book or a card with the title and author. The student must be able to describe the character and share some of the character’s activities with the class. Provide students with a letter to their parent about dressing up like their favorite book character. Freeman, Don. Corduroy. Puffin Books, 1968. Lester, Helen. Listen Buddy. Houghton Mifflin, 1995. Henkes, Kevin. Lilly’s Purple Plastic Purse. Greenwillow Books, 1996. Harrison, David. Johnny Appleseed. Random House, 2001. Berne, Jennifer. On a Beam of Light: A Story of Albert Einstein. Chronicle Books, 2013. Krull,Kathleen. Wilma Unlimited: How Wilma Rudolph Became the World’s Fastest Woman. HMH Books for Young Children, 2000. Teach your first grade students about the setting, characters and sequence of events in a story. This series of lesson plans provides teaching ideas, book suggestions, activities and downloadable worksheets.